Bangkok (Thailand) – November 16, 2018 (travelindex.com) – Michelin released the Michelin Guide Bangkok, Phuket and Phang-Nga 2019, the second edition of the Michelin Guide in Thailand, and the first to cover new territories outside Bangkok: Phuket, Phang-Nga, and Bangkok’s surrounding provinces (Nonthaburi, Pathum Thani, Nakhon Pathom, Samut Sakhon, and Samut Prakan). In this latest edition, 217 dining and 67 lodging establishments are featured – with a total of four two star restaurants, of which one is a new addition; and 23 one star establishments, of which 10 are new additions. Of the 23 one-star establishments in this latest edition, Le Du and Gaa are the only two restaurants that progress from the ‘Plate’ – a designation given to restaurants for a good meal with fresh ingredients and capable preparation – to earn one star, while eight are new entries. Among these new entries, five are located in Central Bangkok: Canvas, a restaurant where art meets food and every dish looks like a masterpiece, driven by premium local produce and a variety of techniques; Methavalai Sorndaeng, where the food has kept loyal customers coming back for more than 60 years, with its blast of flavours and refined complexity; R-Haan, a restaurant offering authentic Thai dishes, both regional and Royal Thai cuisine, using ingredients from all over the country; Saawan, where a set 10-course authentic Thai cuisine menu is the only option, using locally-sourced seasonal ingredients to craft creative and well-executed dishes that provide a truly special journey through Thai flavours, culture and art; and Sorn, a restaurant with a focus on long lost recipes and the art of Southern Thai cuisine, using ingredients sustainably sourced from a trusted network of farmers and fishermen, as well as refined and sophisticated cooking techniques. While the other two one-star restaurants are located within Bangkok’s vicinity: Ruean Panya (in Samut Sakhon province), a family-run restaurant recognised as a hidden gem with an amazing combination of food and art, where the owner chef’s attention to detail and the complexity of flavours make every dish worth the wait; and Suan Thip (in Nonthaburi province), a restaurant amidst a lush garden of trees and small ponds, where its refined cuisine is inspired by royal recipes. There is one restaurant in Phuket awarded one star: PRU, a sophisticated restaurant, tucked inside a luxury resort, offering delicate and neatly presented dishes created using many ingredients sourced from its own 96 hectare organic farm – even the butter is made in-house with milk sourced from Krabi. In addition, three restaurants previously with one star – namely Elements, Nahm, and Saneh Jaan – have retained their awards, despite having new chefs at the helm. The complete selection of the Michelin Guide Bangkok, Phuket and Phang-Nga 2019 will be available in a bilingual digital edition (Thai and English) on the website and a print version, available at leading bookstores for 650 Baht. Michelin, the leading tire company, is dedicated to enhancing its clients’ mobility, sustainably; designing and distributing the most suitable tires, services and solutions for its clients’ needs; providing digital services, maps and guides to help enrich trips and travels and make them unique experiences; and developing high-technology materials that serve the mobility industry. 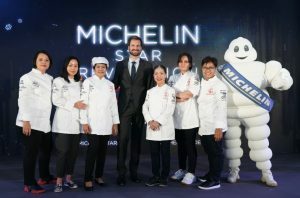 Headquartered in Clermont-Ferrand, France, Michelin is present in 171 countries, has more than 114,000 employees and operates 70 production facilities in 17 countries which together produced around 190 million tires in 2017.